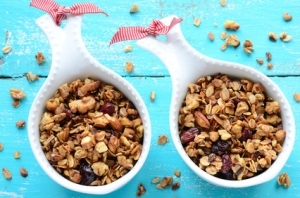 Family and friends put this granola on their Christmas wish list! It is my most requested recipe. This recipe is easy and healthy. The soy nuts are good for your heart and bones and soy helps with menopausal symptom.s The wheat germ,nuts and seeds provide a protein boost. Oatmeal, walnuts and almonds help lower cholesterol. It’s wonderful sprinkled over yogurt! Combine the oil, honey, salt and vanilla in large saucepan. Place on medium heat until the consistency becomes thin; do not boil. Remove from heat. Add the remaining ingredients except for dried fruit, mixing well after each addition. Divide evenly into two 13×9-inch pans. Bake in 350 degree oven for approximately 15 minutes, stirring every five minutes, until toasted to your liking. Remove from the oven, stir in fruit, and let cool. Store in airtight container. Feel free to add/subtract/change the nuts and fruits.